Alaxis is an important Obscure City located in the Eastern part of the Continent, north of Urbicande. Described as “sulphurous”, it is famous for its unending carnivals and celebrations 1). Its government is most complex and riddled with intrigues 2). The city is criss-crossed with numerous canals and its emblem is a cross 3). 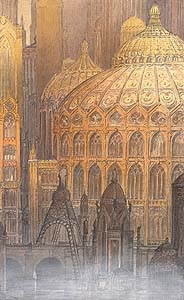 In the days of The Tower, Alaxis was known for its sleek minarets 4), but centuries later they had been replaced by enormous buildings in a gothic style, with a multitude of arches, rosace windows and ornate domes. Many traces of what we would call a mauresque kind of architecture do however remain 5). The man who realised this transformation was Paul Dufournet Horeau, for whom a monument was eventually built 6). The Temple of Valentini is one of the oldest known remains in the Obscure World 7), but Robick mentions that the top of the Second Hill, where it is built, was not left in ruins 8). Mary Von Rathen visited the city at 2nd of September 747 AT with her family. She started to lean after the world started to shake while was in the Star Express ride of the Cosmopolis entertainment park. The Von Rathen family didn't like the looks of the people in Alaxis very much. They all seem to be quite poor 9).